HomeBeing a CatechistSharing StoriesHow Long Have You Been a Catechist? Let’s Hear Your Story! Often, when I do presentations for catechists around the country, I ask my crowd, by show of hands, how long they have been a catechist: newbies? 1–5 years? 5–10 years? and so on. I’ll never forget how one woman, at a presentation in Texas, had her arm up through 40, 45, 50, and 55! I finally just asked her how long she had been a catechist, and she proudly announced, “60 years!” as the crowd applauded. I responded, “That’s longer than I’ve been alive!” at which point she said, “I know!” and stood up to take the microphone away from me to share her story! I gladly sat down to listen! Like all catechists, her story was unique and fascinating. God calls us in so many ways. This brings me to the question I’d like to ask you: How long have you been a catechist? To answer this question, click the little poll below, and indicate how many years you’ve been serving as a catechist. We’ll be able to see the results as they come in. 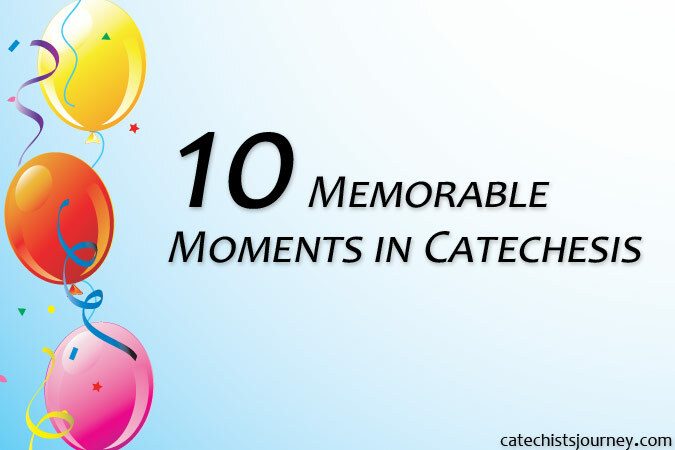 Then, in the comments box below, share your story of how you became a catechist. I look forward to reading your wonderful stories! How long have you been a catechist? Stories on the Journey – First Topic: How Did I Get Into This? 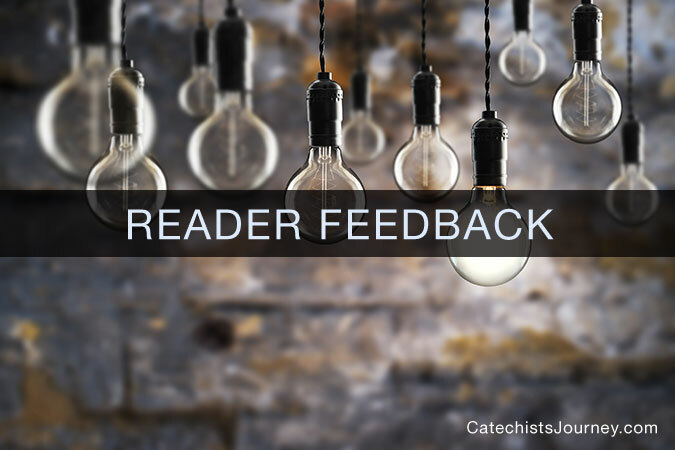 40 Comments on How Long Have You Been a Catechist? Let’s Hear Your Story! I became a catechist the year my youngest daughter entered Kindergarten. I have taught just about every grade over the years. four years ago I was asked to take over the DRE position. I am still in that position and learning new things about our faith almost daily. Love showing these children the way to the Lord. Monica, like so many DREs, you started as a catechist! I’m glad the opportunity came your way and that you are finding it fulfilling! As an education major in college, I volunteered as a preschool catechist in the local parish as both a way to help in the parish and to get some ‘classroom’ time. Forty years later, I have been serving as a CRE and DRE for over 30 years! Wow, 30+ years! That’s awesome, Terry! My husband was in the first RCIA group in the ‘new’ format in 1985 and came to full communion at the Easter vigil in 1986. The process was different then since he wouldn’t have participated in the Easter Vigil today. The next year I was asked to be a sponsor for a college student preparing for Confirmation. The following year my husband and I were asked to work in the Inquiry portion of the process … prior to the Rite of Welcome. Roles changed in the intervening years but I am still involved with adults in the RCIA process. Thanks, Maryann. Isn’t RCIA a wonderful ministry?! I have been a catechist for 38 years. When I was in high school, Bishop David Thompson (then our pastor) asked three friends and me to help in the CCD program. We did, and thus began an amazing adventure of leading others to grow in faith in Jesus while being challenged to live an authentic Catholic Christian life more and more each day. In this ministry I am richly blessed as I strive to live the words of St. Francis: preach the Gospel always; use words if necessary. Thanks, Christina…I love your description of how you’ve been challenged to be more “authentic.” So true! I was in College going for a Pre-Dental Degree (Biology with a Minor in Chemistry)and wanted to give back to the community. I am from Colombia and had been living in the United States for about 15 years. I knew my faith and prayers in Spanish, but I felt the call to learn my faith and prayers in English so I could participate more fully at English Masses. During that year our Church was asking for Catechist I decided to sign up and I asked what age group they needed help in they said first grade. I decided to teach each year twice in that time I finished my degree, I became close friends with the Children’s RE Director at the parish and My mom was taking Continuing education Classes at University of Dallas in Bible Studies. I talked to the RE director and told her I was having doubts about applying to Dental School, because I had seen a brochure from UD offering a Master Degree in Religious Education Director, and that called my attention. The director told me to pray to God and ask him to hit me with a 2 X 4 to see where he was calling me to. In 2013 I got the opportunity to go to World Youth Day in Rio, and I decided to turn in my paperwork to UD the day before we left on the trip. As God had it all planned it was a wonderful experience at WYD and the week after I came back I got my acceptance Letter from UD. In 2016 I was the first Alumni to graduate from UD with a Masters Degree in Catechetical Ministry. Summer of 2016 I got a job offered as Family Life Director at a parish, two years later the position for Coordinator of Children’s Faith Formation opened up where our former pastor from the Parish I was working at had been moved to and I applied for the Position. I have been in this position for the past 8 months and love it. I love to see the how children grow in their faith and once God touches their hearts. It has been a blessing being a catechist and working for the Church. Wonderful story, Laura! Congrats on being the first graduate from UD with a Masters Degree in Catechetical Ministry! It’s an excellent school! At age 20 I was newly married and wanted to help at my church, St. Pius X in Mountlake Terrace, WA. My mom, who had always encouraged me with my faith said, “That’s great but whatever you do, don’t teach the 7th graders!” Well, of course that is the exact class that needed a catechist. Being young, I pushed my mom’s advice aside and took on the 7th graders who gave me no problem at all! It was a great year! God lead me on to other grades and eventually I was offered a job. I feel so blessed to have taught for 17 years! God is so good! Thanks Karen! I taught 6th graders and 8th graders and always felt like something must happen in 7th grade to turn them over to the “dark side!” 😉 That was probably your mom’s fear as well. I’m glad you didn’t shy away from the experience of teaching the “dreaded” 7th grade! Thanks Margie! Your dedication and enthusiasm are keeping you YOUNG!!! My husband and I hv been Catechists for 4 yrs. we were lapsed Catholics for a v Long time and had not been to confession for abt 25 yrs!! We have 3 sons and one day when our eldest Son was 11, he suddenly had a terrible fear that the devil was after his soul. What we thought was just an idle mind lasted 1.5 yrs! We took him to counsellors, sought advice from books etc., but nothing worked. Finally we turned to God which became our turning pt back to him. Through a conversion experience retreat and slowly picking up the pieces to return to him, we re-discovered our faith, Praise the Lord! Now we’re both active Catechists to both young children and teens! The best part is that as we plan our lessons and attend faith formation courses, our faith has deepened and we’re falling more in love with God,l and Mother church. Thanks Lynette! Thank God you and your husband re-discovered your faith! Welcome back! I was a Religious Ed Mom attending a parent meeting when the DRE asked me if I would like to teach 1st grade. I was so excited & honored by the invitation. I went home telling my husband & kids & my kids answered “ YES – you taught us the whole book & more Mom!” I taught First Grade my first year & DRE moved me to teach 2nd graders & I have been teaching 2nd Graders ever since & I’m still in awe every year. I attended every classes (& read a lot) I could to get certified. I was so touched & blessed to receive it from Cardinal George! I’m always in awe & excited to teach every year!!! Thanks, Marizel! Your enthusiasm is contagious! I have been a Catechist since I turned 18. That was 1964. I continued teaching & taking time off only to give birth. When my youngest was in 1st grade, that meant she was in school all day, I enrolled in the Ministry Program In St Elizabeth College in Morristown NJ. It was to become a DRE, but I was just looking to enrich my classes. My pastor found out I was going & offered me the DRE position immediately! So for 25 years I was a stay at home mom & now I was a wife, mom, student & DRE. God works according to His calendar, not ours! Back to being a catechist as retirement took us first to VA. and now AZ. I love it and as long as God gives me the strength, I will serve Him! Thanks Alice! I did the math and, if I’m correct, that means you’ve been a catechist for 55 years! That’s almost as long as I’ve been alive! God bless you! I became a catechist when my youngest was in first grade. She insisted that I teach her. I was not new to teaching religion though. I am a convert, was Lutheran, and had taught 3rd and 4th grade Sunday School while in high school. Almost seven years ago we moved to a small town and I asked about teaching CCD and was jokingly told I could probably be in charge of it all. Guess I was, I over night became DRE as well as teaching 7th/8th grades because I couldn’t find anyone to take that class. I am still DRE, however I am very blessed that it has become more of a committee leading it. I have taught 1st grade, 5th grade and JH. I think JH is definitely my calling. I enjoy that age group. They are starting to really think abstractly and the questions they can come up with! I fell that I learn much more than I possibly teach. I don’t see giving up teaching, ever. Thanks, Dawn! And here’s hoping you don’t give up teaching ANY time soon! or EVER! I have been a Catechist since the Fall of 1991, had to take a few years off when I lost my job and went back to school to get an Associates degree. I have taught 4th grade, 6th grade, RCIA and subbed in almost every other grade. I started when my youngest was in 1st grade because I had to drive the boys there an pick them up and thought why not just stay and help out. I have increased my knowledge of the Faith over the years and still learn more with each class. The kids can have some interesting questions which prompts me to learn more. I have been a catechist for 4+ years now. The thought started when I wanted to teach vacation bible school and I was inspired by a childhood catechist who taught Sunday school at her church. I went in to our DRE to see if she needed help with PSR, the 1 to 5th graders. She asked me to help with EDGE (6-8 graders) instead. And that’s how it began for me. I love to teach most especially because I learn a lot as I prepare for the lesson, reading the lesson plan and associated scripture. In order to be more equipped to teach, I have also been attending faith formation classes in different parishes when they’re offered. I am currently enrolled in a two year certification course. It’s been a little over a year now. I am learning A LOT! The meaning of evangelizing by action has been driven home for me and slowly I really believe in calling myself a catechist. That took a while. I enjoy teaching the kids, what a blessing they are! I have been offered the job of youth minister for EDGE and Lifeteen and I am having trouble deciding. Please pray for me to help me make a decision which brings me peace. I would love to do it, but want to make sure it’s for the right reasons and God is in accord. Evelyn, so good to learn about your certification process! I wish you well in completing it and pray for inspiration for your decision about youth ministry. My humble journey started in 1989 after Confirmation. My catechist was Mrs Violet Meruti and her team then was a all female team. I encouraged some of my boy friend to join the team and they only lasted a few months. I continued and the next year I was Commissioned as a Catechist. As I work in the Mining Industry and travel a lot in the Northern Cape South Africa, I used every opportunity to teach the Good News wherever I found myself in small mining towns around Kimberley. In some towns and villages it was a first for the congregation to see a young male catechist. I’ve been using your techniques and lessons to improve my teaching skills. The Bishop and priests in our Diocese are very supportive of our diocesan catechetical team that we formed 10 years ago. I love reading everyone’s stories and hearing about their journey! I put a note in with my oldest son’s PSR registration saying that I’d be willing to help out from home with things like sorting handouts and cutting out things. I was pregnant with my 4th child and due at the start of the school year. The day I came home from the hospital with my baby there was a message on our answering machine from the DRE asking if I would be willing to teach 2nd grade PSR. I called her back and told her that I was just getting home from having the baby and if she could give me 6 weeks (which would have me starting in late October/early November) I would be willing to help. She was and I did! I was a 2nd grade catechist until 2015 when the DRE retired. She asked me to to come in to the office to interview for the position. I went into interview and shadowed her for that school year. I am now finishing up my 4th school year as the DRE for our parish. It is such a blessing to walk this journey with these families and growing in faith together everyday! A friend of mine recently pointed out that I have been a catechist for *literally* my entire adult life. I had never thought of it like that before. Very grateful to be called to this vocation. Thanks for all your excellent and practical tips! Thanks, Kathleen! It was good seeing you in L.A.! After I was Confirmed in the 8th grade in CCD as I was a public school kid. Sister Laura a Sister of the Holy Family of San Francisco who was the DRE at the time came up to us and asked us how were we going to live out the commitment of our Confirmation and before we could respond she signed us up to be catechist aides and by our sophomore year in high school we were catechists. Later on in my life I became a parish DRE and now a Diocesan Director. It all started with an invitation of what will you give back? I’ve been involved in Catechetical ministry for about 30 years. Thank God for Sr. Laura! Great story, Robert! As a homeschooling mother of four I feel such a responsibility to provide an amazing and custom-tailored education for my children. That feeling of duty is compounded when I consider the religious education of my children because nothing is more important than for them to learn the beauty and power of their faith. So I began teaching when my oldest began Catechism and I am now almost done with my second year of serving as DRE. I feel blessed to have the opportunity to teach, guide, and watch grow, not just my children but all the children of our Parish. I know that I am sharing my God-given gifts but I gain so much more than I could ever give. To watch children grow up in faith is to witness a miracle every day. Thanks, Anita! How true that we gain so much more than we give! I became a reluctant catechist at age 13 when my atheist art history teacher kept respectfully challenging me about what all the historically Christian art was really about. Since I was raised from 0-13 in a French Catholic parish, I had asked a ton of questions of my family and anyone who would listen about what all the statues and paintings and symbols were that decorated our church (built a la Cathedrale–Franco-american dreaming at its best). I became a catechist when I returned home after college graduation. Thought I should give to my parish and RE was always looking for volunteers! Once you get involved, it’s hard to stop! Between sharing with the other volunteers and the kids, a catechist always gets more than they give. Through getting married, having kids, and career changes, it’s one thing that has stayed. Currently I’m doing Sacramental Prep with our kids and their families. Each year is interesting. Been doing this since ‘83. Thanks, Colette! Doing the math, I see you just celebrated your 35th anniversary as a catechist! Congrats!